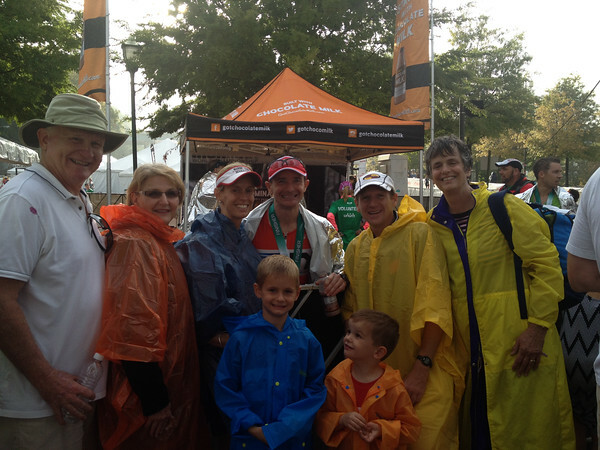 IRONMAN® Chattanooga Race Report: Mark Roberts, 10:05, 1:08 PR! Team Roberts at IMChatt, enjoying the finish after a great race! 23 AG of 400 or so starters. 121 Overall. This was my 6th Ironman but first since 2010, and my first since I really got more consistent in my training the last few seasons racing halfs. Race week was great – I could do a whole post about Chattanooga and the venue but we’ll leave that for another post. Got in 4 hrs of light training during the days leading up to Sunday and went in to the race with an ATL of 70, CTL of 115 (down from 134 peak) and TSB of +34. FTP259, 137lbs, Watts/kg = 4.15, VDOT 54.7. Up at 4 am, English muffin w almond butter/honey, banana and 300 cal sustained energy breakfast and COFFEE! I had actually done the caffeine fast for a week and I think it helped me on race day? Maybe? Hope so anyway. Katy and I left for transition about 4:45 and had a short 3-block walk from my hotel. Bike prep was uneventful, and met the team for the team picture at 5:30. After the picture, Dino and I got on the bus for the short ride to the swim start. We had a great spot on the path right across from all the porta johns. We also waited with Kori and her husband and some people from Michigan. I had no real way of knowing how far back we were, but the wait seemed to go quickly. The IM folks gradually squeezed the line down, pulled out all the wetsuit swimmers and it was time to go. I had a bottle of perform to sip on while waiting and took a gel about 15 minutes before the start. The swim start was actually very well organized – I was pleasantly surprised. With music pumping I made my way down the dock and got in the water about 7:39, roughly 9 minutes after the age group start. I suspect I was mid pack among the people who didn’t wear wetsuits. End of the dock, jump in feet first and find easy race pace. The swim start was the least contact of any ironman I’ve ever done. People seemed to spread out quickly. Some were right over by the buoys, which ran in a big arc following the river topography – Others were way out by the kayakers. I tried to follow the buoy line although in hindsight I think swimming further out and targeting the island until you can see the bridges would have been faster and more direct. Contact was minimal and the water was smooth. The course narrowed down after passing the island and going under the bridges and got a little choppy near the end. When turning into the swim finish you could really feel how much current there was trying to swim across it. Off note – during the last part of the swim I also got pretty COLD! Up the stairs, run along the river, up a big ramp, cross the road and into T1. It was at this point that my right hamstring cramped up. I’m halfway trying to run and shake it out at the same time and generally looked like I’ve never been in T1 before. I didn’t see my wife, Katy, at the swim exit until I heard her yelling “You missed your bag!” Turned around, grab my bag and ran into the change tent. Even starting where I did, I must have passed a good number in the water as the change tent was not very full. Found a volunteer – pulled off swim skin, opened bag. Helmet on, stuffed salt tabs and nutrition in pockets from the big ziplock bag, handed empty bag to volunteer and took off. My cramp had subsided at this point – It’s a long transition area through a parking lot. As I neared the chute to hit the mount line I leaned bike against the fence, slipped on my shoes without tightening them (do that on the road) mounted the bike and was off. Time = 6 minutes. Not bad- could have been faster with out missing my bag. 5:19:40 for 115.4 miles @ 21.77 mph. Goal watts – 190NP ; Goal time <5:30. The early part of the bike is a little dangerous. The mount line wasn’t too crowded, but the early miles of the course were. Many turns, rough roads and railroad tracks. IM covered the railroad tracks with mats, but at the first few crossings there were bottles everywhere. People were generally all over the road and I rode very carefully through the first 5-7 miles. That being said, it was faster going out than I remember it from camp and I believe we had a tailwind that was minor but 2-4 mph out of the NE. I hit the Dollar Store at 11 miles in 30 minutes and settled into goal pace and my nutrition plan. First trip out to the end of Cove was very crowded – Lots of people crushing it up the hills, out of the saddle. I used my gears spun up the hills, pushed over the top and passed many on the downhills. It was difficult to stay of the back of the big groups and I burned a few matches trying to get ahead of some groups only to be repassed on every hill. As a result I rode lower watts going out than my goal watts but speed was good so I didn’t worry about it. The section from Cove to Chickamauga was less crowded as I passed many cyclists and it started to thin out. Watts from Cove to Chickamauga were 183NP as it was difficult to keep them up on all the downhills and I had two long coasting natural breaks. The 2nd lap was even less crowded. I got caught by a group of 10 or so at about the 60 mile mark and all of them except for 1 guy were still hammering up every hill. I rode my game plan and gradually that group fell apart as people fell of the back. I think I caught them all except the one guy who was riding smart. I still felt very fresh making the turn at the end of Cove and my NP was only 183 or so – Lower than my goal of 190. I was ready to push the final stretch to Chickamauga and get back town. Nutrtion and hydration at this point had gone very well – For the ride I ate 1¾ power bars (dropped one piece), 3 Power gels, and took 10 Saltstick caps. I also peed 4 times on the ride. Hydration was plenty and probably a little too much given the weather, which was considerably cooler than everything I trained in. I write this because at about mile 90, I was cresting one of the steeper rollers (12-14% by the farmhouse with the pool and the slide) and my right quad and adductors cramped up – I spun up that hill and shook it out on the next down hill. A few miles later, the right leg cramped on a climb. I took quick assessment – Calories = plenty. Hydration? Check. Plenty of sodium. NP at this point in the ride again was 183 or so – Yet I was still climing hills in my gears based off of 190 NP. My quick assessment was that my hill watts were too high above the watts I was actually riding so I decided from then to end to shift all my power gears down by 5 watts. Speed avg. was still 21.9 at this point so I didn’t think I’d be giving up much and hopefully avoid any cramping issues going into the run. Kept on my nutrition plan, got through Chickamauga and back into town with no more cramping. Hit the bike line, flying dismount, handed off bike and felt good running to get my back other than my back being a little tight from 5:19 in the aerobars. Speed fell off a little getting back to town but I felt great, fueled, and ready to run well. 8 bottles perform, 2 power bars, 3 gels and 10 salt stick caps – Totals: 400 cal/hr , 30.2 oz fluid/hr, 1273mg Na/hr. Right on target with my training rides. 4 minutes – A little slow. There were lots of bags remaining and few people in the tent when I got there. Took off helmet running to tent and opened my bag. Socks and shoes on, taking extra time to tie them tightly so as not to get motion on all the hills. I had a mental fade here as the volunteer opened my ziplock bag and started taking stuff out! It’s ok I said and I just grabbed it and headed out – Quick stop in porta potty on the way out and then had another rookie move when I realized my shorts pockets were full of gel wrappers and empty change purse from the bike. Emptied them in T2 by a trash can, watch on and FINALLY out. Stopped briefly at the run out to get hit with sunscreen. 6 of them got me at once! Despite planning and thinking about T2 ahead of time it certainly could have been faster. Best possible run according to VDOT was 3:30. Goal run given terrain 3:35 to 3:45. This was it. My one thing was to nail this run as I have never done it in an IM marathon. I took it really easy up the ½ mile hill by the aquarium. On the tracker it was one of my slowest miles of the day, which was by design. Once at the top I cruised down the hill and onto the path. I felt so good at this point but immediately was focused on my heart rate, pace and aid station protocol; I came off the bike at a heart rate of 137 and had planned to run at under 145 until the line which for this race was the right turn onto Amicola Hwy at about mile 17.5. After mile 1, the miles clicked off in the low 8’s while holding heart rate under 145. Whenever I saw 145 I eased up slightly. If I saw 139-140 I picked it up a little. First lap felt great. A few people caught me early but after that I saw very few athletes. I could see more people – 1’s an 2’s further up the road once out on the hwy but I think I only caught and passed a handful of people on the first lap. Once crossing the bridge I started to catch more people. The first time up Barton was the first test – Legs responded well as I let the pace drift up into the mid 9’s and heart rate rose to 150. Pushed the downhills and the heart rate came right back down. Nutrition and aid stations were going well – I rehearsed the protocol in my mind before each one. Sponge, cool off – Grab Perform late and walk 20 steps, drink, repeat. Only variation was salt tab with water every 30 minutes and Power gel every 45 min. Nutrition plan didn’t vary much from this although I skipped Perform at a few aid stations after taking gels – I could feel when I was topped off did not want to overdo the calories. Hit the first lap in 1:50:27 and knew if I could hold it together I would have a very good run. Saw my family before starting the 2nd lap and Coach Rich — I yelled at him “It going good” and was back focus. At this point I just needed to get out down the path to the turnaround and then it was time work; Heart rate starting to ride 145 at this point. It became a little tougher to stay on pace on the 2nd lap because it got so crowded. While I was starting to fatigue, the biggest issue was the speed differential between me most of the people around me made me feel like I was running too fast and I found my self inadvertently slowing down at times – I had to focus on my pace to keep the pace up more and more as the miles ticked off. Turned onto Amicola Hwy just before mile 18 and was ready to go. Legs were starting to fatigue at this point and I had a short conversation in my head – Do I maintain? Don’t risk cramping? Or pick up the heart rate and push. This conversation lasted about 2 seconds. I didn’t know exactly where I was in the field, but I had permission to race at this point – I was ok with pushing for several miles and if it cost me late, so be it. I shifted gears aiming for 150 HR. Mile 17 and 18 were faster than the previous 4. I still knew though that the real test would be the climb up to the bridge and both sides of Barton ave. Mile 20 in 8:26. Saw my family at the bridge crossing the river. My wife said, “It’s about to start to really hurt, but you owe it to yourself to push through the pain and finish strong.” She says I did not even look at her, but I heard her. Focus. Climbing Barton the 2nd time was tough – I kept moving though still keeping the pace in the 9’s not caring about my heart rate at this point. Down the other side, Up Hixson. Mile 24. 2 to go – Right at the base of Barton I came up on Tim Cronk. I think I said something like “Come on Tim!” He gave me some encouraging words as we started up the final climb. Over the top and letting it Fly down the other side and I see EN member Jason Cox in the distance. Again – not having a clue where I was in our age group, but knowing that he’s in my age group he became the next carrot. Pushed the pace all the way down the hill. When I caught him at the bottom I gave him an “Alright Jason” and pushed on. He seemed to pick it up when I went by and I pushed even harder. At this point heart rate was well above 150 and I felt like I was running a 5k. I started to get a side stich, but didn’t slow down. Saw Coach Rich on the bridge and he alerted me that someone was coming. Turned out to be guy from Birmingham and he was in my age group. He went by me flying and I had nothing to chase with as I was already on the limit at this point. Left turn after the pedestrian bridge and left onto Aquarium Way. Crowds deep on both sides. I had thought about this moment during camp and what it would be like. Ran down the hill covering the last quarter mile in 95 seconds. Onto the carpet – Mike Riley calling me in. It was as good or better than the first time 12 years ago. Nutrtion was near perfect – I estimate of the 24 aid stations I took a cup of perform at 18 of them – Some were water only with gels and a few were skipped. 4 gels, 6 Saltstick caps = 295 cal/hr, 991 mg Na/hr probably 25 oz/hr perfrom + water. Nutrition was spot on. While I didn’t negative split the run, I ran the first 13.1 in 1:50:27 and the 2nd 13.1 in 1:51:40. A positive split by 1:13. According to Strava I was only 10 sec slower on the back side of Barton on the 2nd lap. My last 3.6 mile segment was paced at 8:14 which was one of my fastest of the day. Overall I’m thrilled with my race – A PR by 1hr 8 min, and personal bests in run and bike (and the bike was 4 mile long). I probably left a little on the table on the bike, but I think backing the power down a little at mile 90 or so may have saved my run. That being said, the bike course is very fast if ridden correctly. I was surprised at the speed I got for the watts I put out, but I think I have a pretty good aero setup and I’m a little guy! Also – this run course is VERY challenging. It was good to have spare TSS from the bike and I think it definitely contributed to a solid run. No major lows; only issue was dealing with the cramping late in the bike. I saw my family twice on the bike and 5 times on the run as well as Coach Rich several times. Those always gave me a lift but I remained very focused. The swim start was exciting as I was so glad to finally be racing this thing I’ve looked forward too since summer. The finish was unbelievable. I didn’t even know I’d come so close to breaking 10 hours until they handed me the results card in the post race area. I had a great run and finally ran to my potential. I also went ALL IN when the time came. I tried to race with an incredible focus – Something I learned from my wife when racing Marine Corp marathon with her last year. She is a 3X Ironman herself and has largely relegated her triathlon aspirations to the back seat while being a full time stay at home mom to our boys, running marathons and starting a run coaching gig with some local athletes. She was so supportive and encouraged me to give Ironman a shot this year – I am grateful and appreciative of her support and also realize how lucky we all are to get to do this. I tried to take that attitude into this race, and everyday into my key training sessions; to not waste the opportunity. One of my favorite quotes is from Steve Prefontaine who said “to give anything less than your best is to sacrifice the gift.” Racing Ironman is a gift. I did my best this year not to waste it. Many thanks to Coach Rich and Patrick, Endurance Nation, our WSM’s Tim, Al, and others, all of you that I met at camp, and to my family for their enduring support. It was a great day. Wow Mark. That was an amazing improvement in your IM time. Congratulations!